Smoking and vaping are not allowed in enclosed public places. 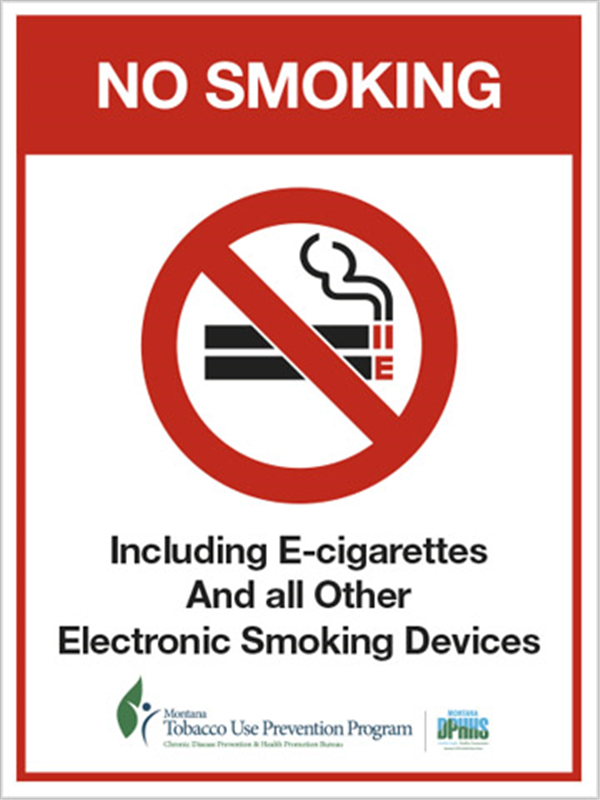 Business owners/managers must post a sign (in a conspicuous place) at all public entrances stating, smoking in the enclosed public place is prohibited. Healthy Gallatin is committed to addressing the public health crisis caused by the use of all forms of commercial tobacco products. Through funding made possible by the Montana Tobacco Use Prevention Program (MTUPP) we work with community partners to eliminate tobacco use, especially among young people. (800) QUIT-NOW, is a FREE service designed to help you quit. Call now! New! American Indian Commercial Tobacco Quit Line with a dedicated line 1-855-372-0037 and web based enrollment www.MTAmericanIndianQuitline.com. reACT is Montana’s teen-led movement to protect our generation’s health and freedom from tobacco. Healthy Gallatin reACT joins youth empowerment movements across the state and country in recognizing our power to take on the leading cause of preventable death: commercial tobacco use. Healthy Gallatin works with landlords and tenants of multi-unit housing complexes to protect vulnerable, at-risk Montanans, including children and seniors from secondhand smoke. More info for tenants and landlords can be found by visiting tobaccofree.mt.gov. October 1, 2009, marks an important day for tobacco use prevention in Montana. 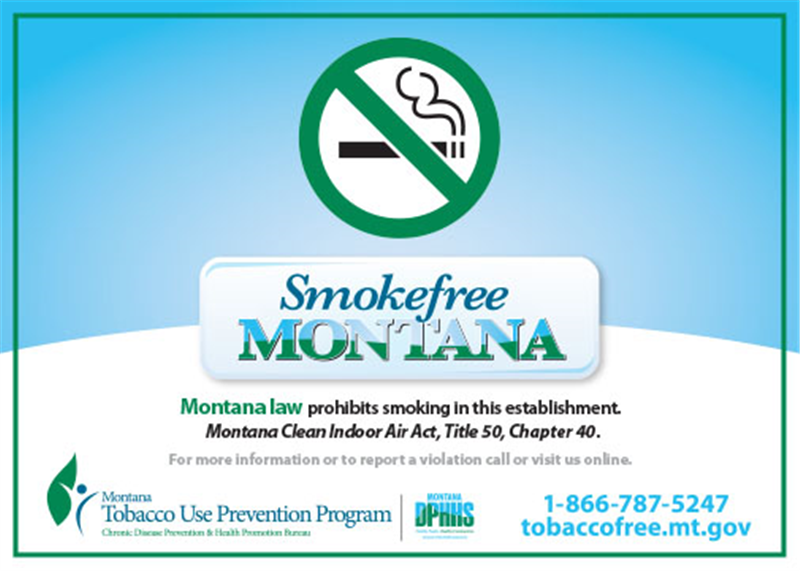 Full implementation of the Montana Clean Indoor Air Act (CIAA) requires all enclosed public places and workplaces, including bars, taverns, and casinos, to be smokefree. 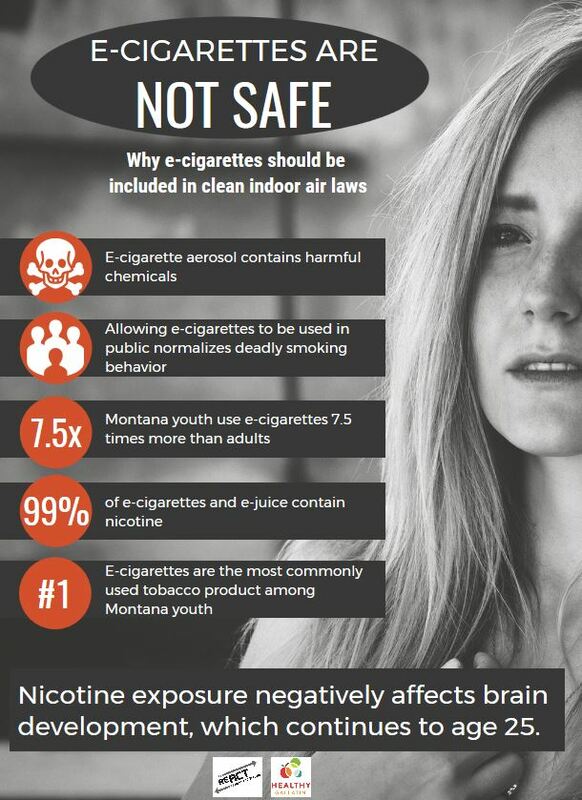 Laws like Montana’s CIAA protect public health and prevent diseases caused by exposure to secondhand tobacco smoke. The significance of this major public health policy extends to future generations who will grow up healthy in a smokefree Montana. We encourage you to learn more about the CIAA by clicking here. The majority of Montanans support the CIAA. This law belongs to Montana’s citizens and we appreciate your continued support. If you observe a violation of the law in any enclosed public place or workplace in Montana, you can report it by completing a violation report form. All tobacco/smoke-free signs and Quit Line materials are FREE of charge at the MTUPP online store. Some groups of Montanans experience unusually high rates of tobacco use. For these groups, smoking rates have not declined significantly in the past decade as it has for the population of Montana as a whole. Women, veterans, low socioeconomic status populations, the mentally ill, and racial/ethnic minorities are especially vulnerable to tobacco use. Through tailored outreach and public awareness we strive to eliminate these disparities. Smoking before and during pregnancy is the single most preventable cause of illness and death among mothers and infants. Quitting smoking is difficult, but the rewards are endless. Quitting tobacco, and staying quit, is the most important thing you can do for the health of your baby. Smoking during pregnancy can lead to lifelong health complications in your baby. If you are pregnant or plan to become pregnant, call the Montana Tobacco Quit Line at 1(800)Quit Now or visit www.quitnowmontana.com. Don’t forget to talk about smoking with your healthcare provider. According to the 2011 Community Health Assessment for Gallatin, Madison, and Park Counties, only 48% of Gallatin County tobacco users report a health care professional has recommended they quit tobacco. Health care professionals are the most trusted source of healthcare information. Want to see the results of your efforts, use this fax referral form to refer you patients to the Montana Tobacco Quit Line. As a HIPPA compliant medical provider, you will receive fax back forms providing patient progress. 3x more likely to succeed! Nationally, nearly 1 in 5 adults (or 45.7 million adults) have some form of mental illness, and 36% of these people smoke cigarettes. In comparison, 21% of adults without mental illness smoke cigarettes. Smoking can cause unique issues for people with mental illness. Nicotine has mood-altering effects that put people with mental illness at higher risk for cigarette use and nicotine addiction. 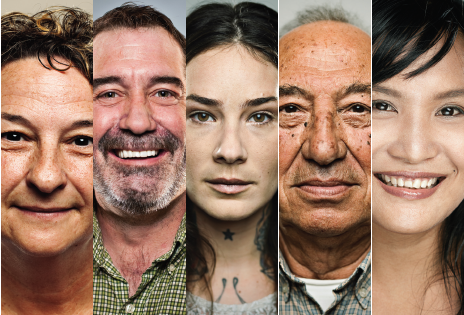 However, recent research has shown that adult smokers with mental illness—like other smokers—want to quit, can quit, and benefit from proven stop-smoking treatments. These treatments need to be made available to people with mental illness and tailored as needed to address the unique issues this population faces. The homeless population is heavily represented by the mentally ill, over half have drug or alcohol dependency, and a disproportionate amount of homeless are ethnic minorities. Homelessness makes people exceedingly susceptible to smoking. Studies suggest that between 70 – 99% of homeless adults smoke. The homeless experience high stress, and feel vulnerable, overwhelmed and helpless. Also, mental illness and chemical dependency can increase susceptibility to marketing efforts that suggest that tobacco can help them cope. Hand-rolled cigarettes without filters, using recycled tobacco from butts, and group smoking can increase the dangers of each cigarette smoked, further endangering the health of this vulnerable population. The hazardous consequences of these behaviors can be seen in the dramatic increase in throat and mouth cancer of homeless people. Social and economic factors influence a broad array of opportunities, exposures, decisions and behaviors that promote or threaten health. Although there are many factors contributing to predicted tobacco use, socioeconomic status is the single greatest predictor. Tobacco and poverty create a vicious cycle: low income people smoke more, suffer more, spend more, and die more from tobacco use. There are other factors unique to this community that challenge traditional prevention methods. Education materials may not be culturally or linguistically appropriate for this segment, and often members of this population live in communities where tobacco advertising is more prominent. Those who work in manufacturing, construction, or transportation are more likely to be exposed to secondhand smoke at work. And, for many members of this population, smoking simply meets a need that cannot be met with something else. Kids who shop in stores with tobacco marketing, such as gas stations and convenience stores, are 64% more likely to start smoking than their friends who don’t. You may ask, what specifically is going on in those stores to cause this difference in risk?